If you've been following along over the last few months, you'll know I've been in a bit (read major) project mode at home with redesigns. Well, I'm keeping it going room by room, first it was the guest bedroom then the kitchen, and now, today, I've got another great makeover for you all! This time it's our master bedroom, and I seriously am so in love with the way it turned out. 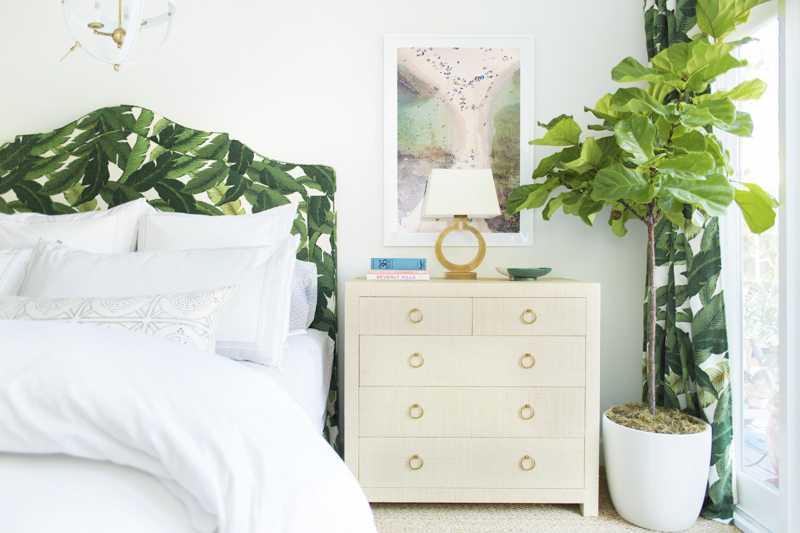 As you know from the guest bedroom, I'm a big fan of Serena & Lily furniture and linens. 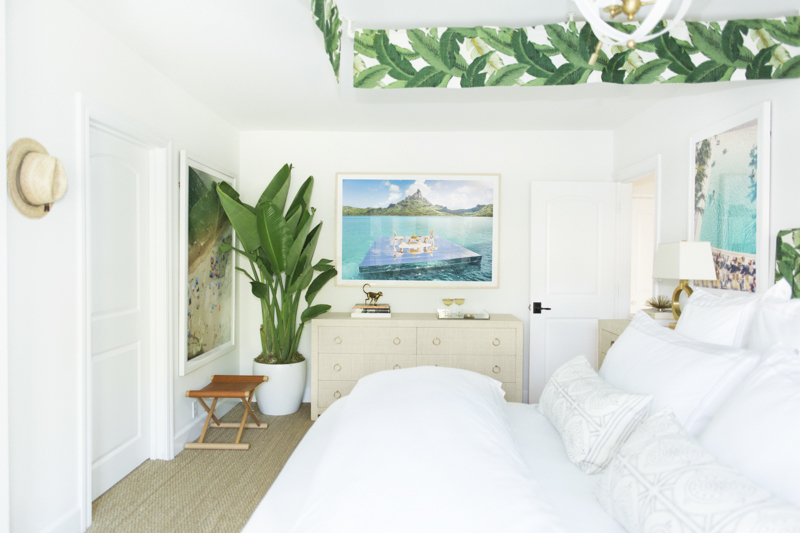 This room turned out so lovely, I was inspired to continue that serene coastal cabana vibe in our bedroom. It wasn't that I didn't like the way our room currently looked but it's just one of those things, once you get started changing your decor you just want to keep going and make it all one lovely story. 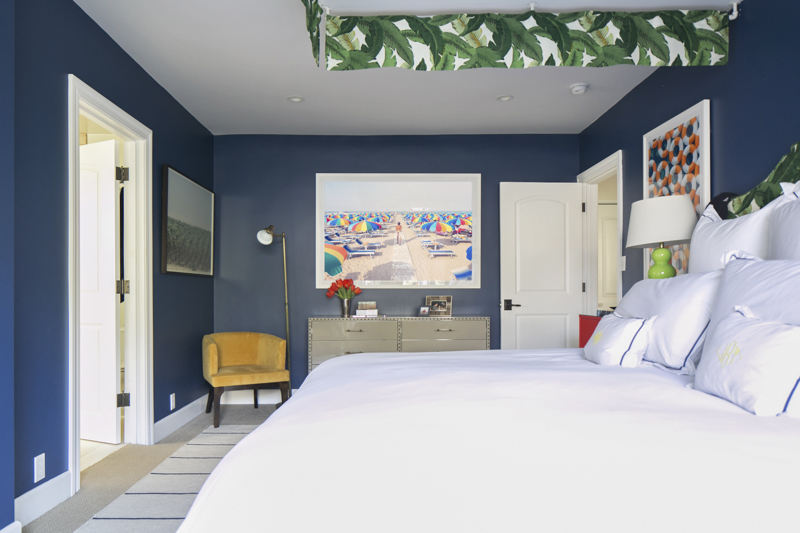 Prior to the redesign, the look of the bedroom was much more contemporary in its use of bright colors and furniture designs, paired with the navy paint. 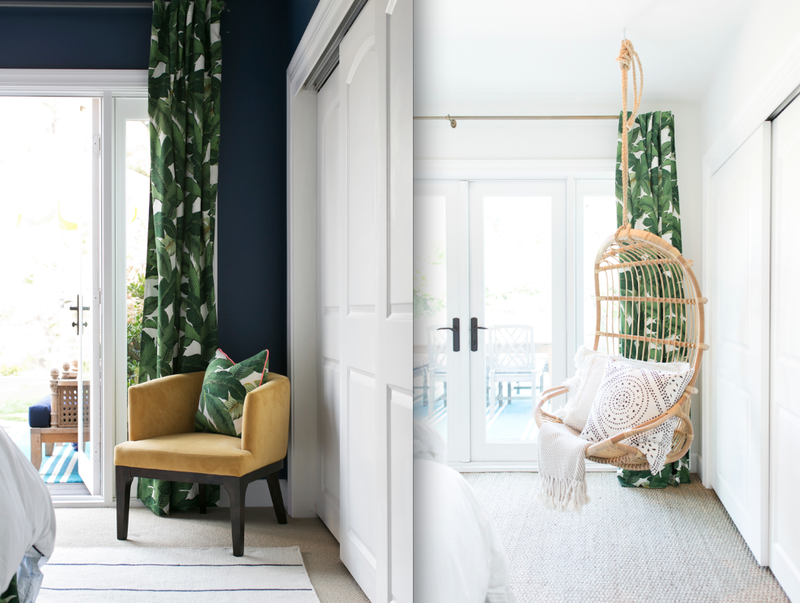 The dark navy was the first thing to go and then the rest unfolded with a new color scheme of neutrals, which allows for the artwork to provide the pops of color and overall mood for the room. It's like NIGHT & DAY right?! The paint was quite an involved process because our original navy was so dark, the walls had to be covered by many coats of the new bright Dove White paint from Benjamin Moore. Also, installing new carpeting throughout the room was a bit tricky; when the existing carpet was pulled out we discovered that the floor was uneven! So, we had to have the floor leveled out before we could install, which was an added expense both in time and money, but it turned out so perfectly, all the extra work paid off. 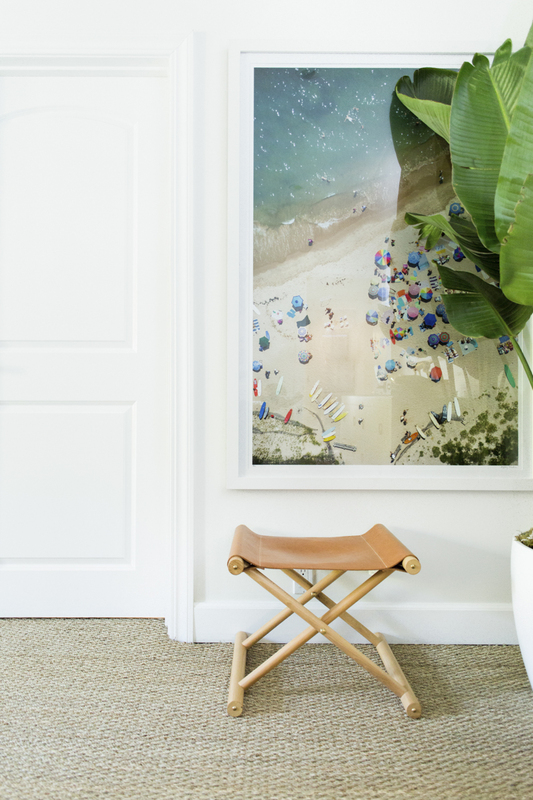 This time I focused the artwork with a selection of beach aerials from my A la Plage series, and then with a center focal point on a new piece from my new series Art of Living. 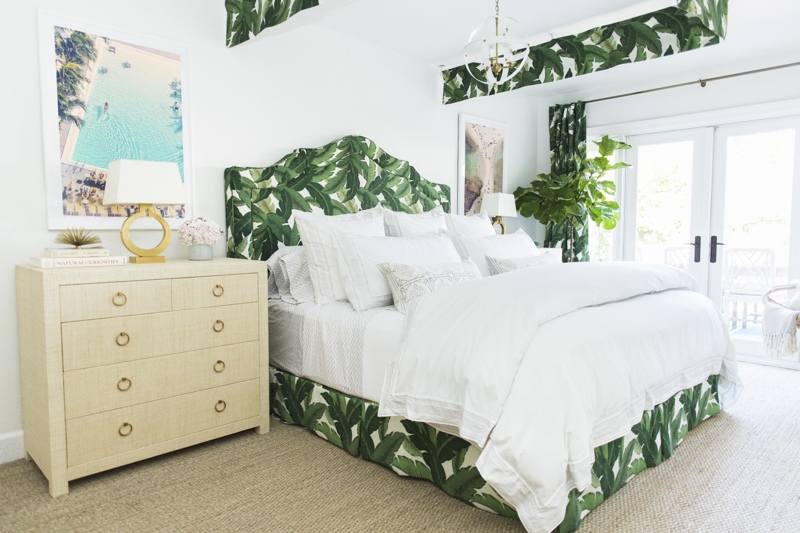 Overall, I love the calming neutral colors from the furniture and bedding combined with our custom fabricated canopy with a tropical design inspired by Beverly Hills Hotel’s iconic print. The biggest challenge was probably agreeing with my husband on which print from my new series, we would incorporate into the room. We liked so many of them, but I think we’re both really happy that we ultimately went with The Den. To elaborate a bit further on why we chose this one, I specifically drew a lot of inspiration for this series from the summer house of my maternal great grandparents. I grew up spending summers here and it is also where we got married. The den of their house is home to an original set of Eames table and chairs, so it holds a very special significance to me as it reminds me of my family and summers spent at this house. Waking up every morning to this piece brings to mind those serene memories and helps me start the day with a positive mindset. When choosing the new furniture, I knew that I wanted to go with neutrals but hadn't expected to also find such an interesting textured option, too with the Blake Raffia Wide Dresser and smaller dresser, which doubles as a night stand, the Black Raffia Dresser, on each side. 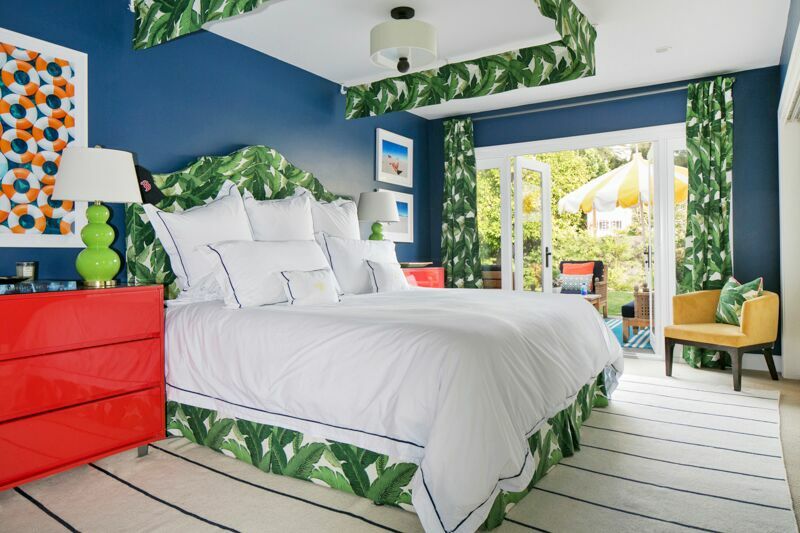 Even the bed linens got a major upgrade from Serena & Lily! 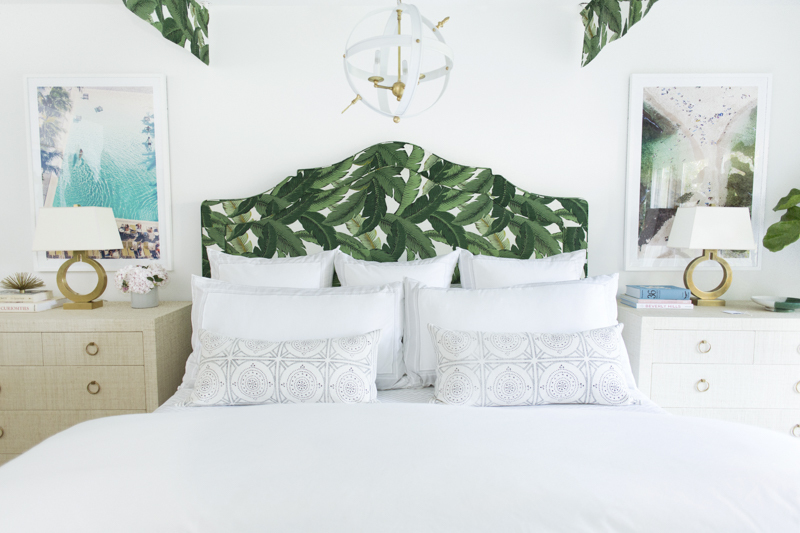 We kept the original banana leaf print that covered our headboard, canopy, and bedskirt, but everything else is a total refresh. 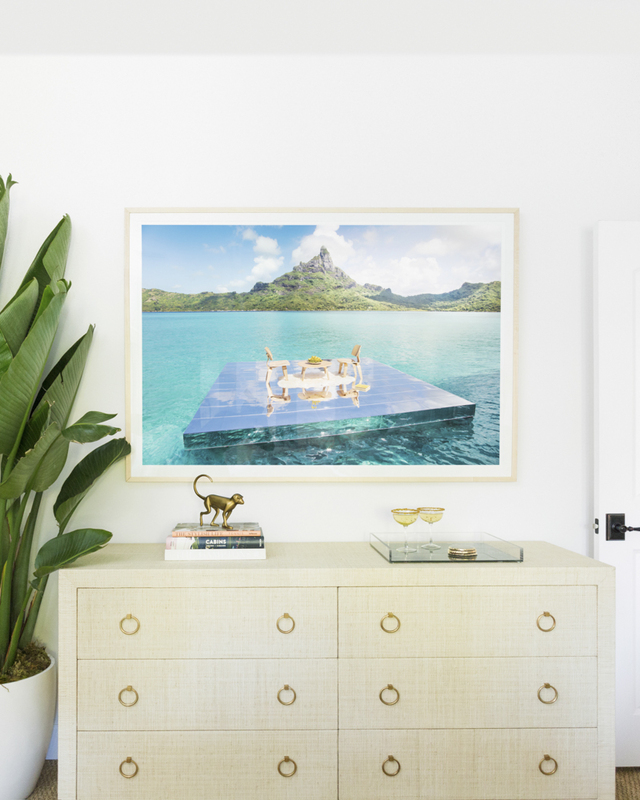 I'm especially fond of the dual Brass Ring Lamps, paired with The Swimming Pool to the left and Poipu Beach to the right, both medium framed in white. Then, I quite actually can't get enough of the our new ceiling light, the Cambridge from Oomph. It casts the most relaxing light in the evening. The side by sides really show how truly changed of a room it is, don't you think? 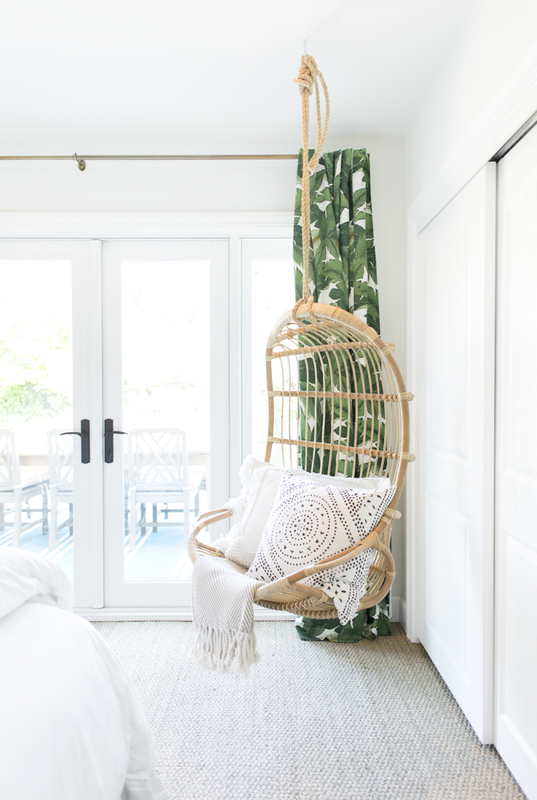 Oh, the Hanging Rattan Chair from Serena and Lily, how I love thee? This one took a bit of convincing with the hubs, but now he loves it as much as I do! It's just one of those pieces in one's house, that when a guest is over, they're immediately drawn to it. It's literally irresistible. Once you see it, you have to try it out, and believe me you're going to like it! I mean, look at what a difference it makes in this corner? I just love it with the Camille Medallion Pillow Cover and throw blanket underneath. 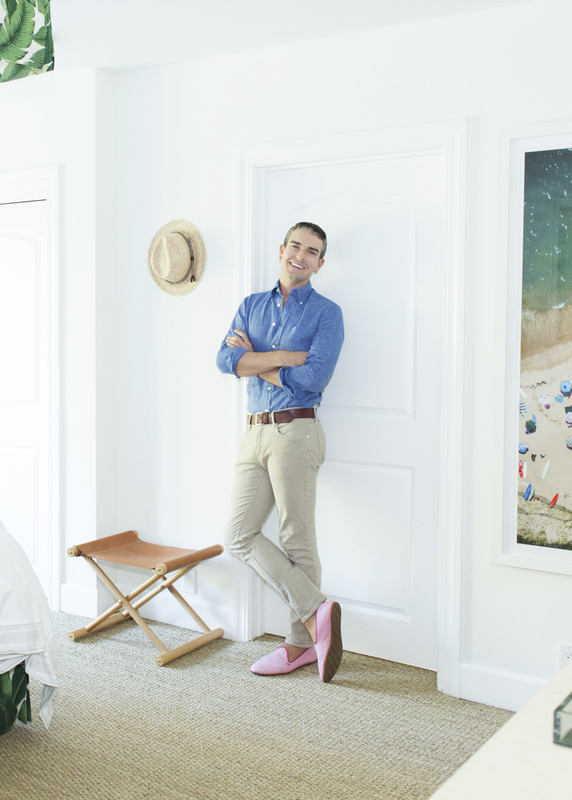 Another corner of the room I'm truly loving now is this little nook, I filled the space with a large white framed Montauk, Point Beach Vertical , where I've spent quite a bit of time this year. Then, underneath is a chic leather stool from Serena & Lily, which sits perfectly next to a potted banana leaf plant. This is the hat that I wear during all of my beach photo shoots. I like having it as part of the decor as it’s a reminder that I am so lucky to love what I do. And, there you have it! Bedroom Redesign is complete!